Blake Griffin's injury has him frustrated after it kept him out of the lineup for Game 1. • T-Mobile Rookie of the Year (2010). • All-NBA Second Team (2012, 2013, 2014). • All-NBA Third Team (2015). • Western Conference All-Star (2011, 2012, 2013, 2014, 2015). • T-Mobile NBA All-Rookie First Team (2010). • Sprite Slam Dunk Champion (2011). • Named T-Mobile Rookie of the Month all six times during 2010-11 season. • Western Conference Player of the Month (February 2014). • Finished third in MVP voting (2014). • Named Western Conference Player of the Week five times. • Los Angeles Clippers record for double-doubles in a season with 63 (2010-11). • Clippers franchise record 27 consecutive double doubles (11/20/10 - 1/19/11). • Clippers rookie record 47 points in a game (1/17/11 vs. Indiana). • Clippers single-season rookie leader in points (1,845), rebounds (989), minutes (3,112), FGM (696), FGA (1,376), FTM (446), FTA (695) and rebounds per game (12.1). • Clippers franchise rookie leader in points scored (1,845) and free throws attempted (695). • Recorded first 20-20 game of NBA career 2/18/12 vs. San Antonio with 22 points and 20 rebounds. • Became the fifth active player to reach 6,500 points before the end of their fourth season. • Joined Kareem Abdul-Jabbar as just the second player in NBA history to average at least 20.0 points, 10.0 rebounds, 3.5 assists and shoot 50.0% or better in his first four seasons combined. • Recorded his 8,000th career point on 4/11/15 becoming one of only two (T. Duncan) active players in the NBA to have scored 8,000 points and recorded 3,500 rebounds in fewer than 375 career games. • Appeared in 67 games (all starts) and averaged 21.9 points, 7.6 rebounds and 5.3 assists in 35.2 minutes. • Led team in scoring with 21.9 points per game, which ranked eighth in the NBA, and finished second on the team in rebounds with 508, placing him 41st in the league. • Only player in 2014-15 to average 21.5+ points, 7.5+ rebounds & 5.0+ assists. Only 19 players all-time and two active players (K. Garnett- 5x & L. James- 5x) held these averages for an entire season... Additionally, only nine players all-time have held these averages for a full season while shooting 50%+ from the field (W. Chamberlain, K. Abdul-Jabbar, M. Jordan, L. Bird, O. Robertson, L. James, C. Barkley, K. Garnett. M. Johnson). • Scored 10+ points 27 times, 20+ points 29 times, 30+ points nine times and 40+ points twice on the season. • Finished 12th in the NBA in field goals made with 574 and tied for 31st in the league in double-doubles with 18. • Named Western Conference Player of the Week for the week ending 11/30/14, the fifth time he’s received the honor. During the week averaged 23.8 points, 9.8 rebounds and 5.0 assists. • Finished second on the team in assists with 354 and fourth in steals with 63. • Averaged a career-high 5.3 assists per game. • Shot a career-high 40.3% from mid-range. • Finished the season with career-best 10 consecutive games of five or more assists. • Finished the season ranked eighth in the NBA in +/- at 583. • Finished 15th in the league in points scored in the second half with 699. • Missed 15 games (2/8/15 - 3/13/15) due to right elbow surgery. • Tied a career-high with two made three-pointers on 12/8/14 vs. Phoenix, including a game wining three point buzzer-beater at the end of overtime. • Notched 15th double-double of the season on 3/15/15 vs. Houston with 11 points and 11 rebounds in his first game back after missing the previous 15 due to right elbow surgery. • PLAYOFFS: Appeared in 14 games (all starts), averaging 25.5 points, 12.7 rebounds and 6.1 assists in 39.8 minutes. • Joined Oscar Robertson (1962-63, 31.8 points, 13.0 rebounds & 9.0 assists) as the only two players in NBA history to average 25+ points, 12+ rebounds & 6+ assists in a single postseason. • 4/26/15 at San Antonio, tied a franchise postseason record with 17 defensive rebounds (DeAndre Jordan at Golden State 5/1/14) on his way to a postseason career-high 19 rebounds in Game 4. • 5/4/15 at Houston, recorded 13 assists, the most in any game of his professional career. • Amassed 357 points, 178 rebounds and 86 assists in 14 games during the 2015 NBA Playoffs. No other player since 1985-86 has eclipsed these totals in all three categories through their first 14 games of a single postseason. • His 6.1 assists per game in the postseason rank as the third-highest assist average of any power forward in a single postseason in NBA history (K. Garnett, 99-00- 8.8 apg & P. Gasol, 12-13- 6.3 apg). • 4/22/15 vs. San Antonio, recorded first career playoff triple-double with 29 points, 12 rebounds and 11 assists in Game 2. •5/2/15 vs. San Antonio, recorded a triple-double in the Clippers’ series clinching Game 7 win, becoming one of three forwards since 1985 (S. Pippen & J. Worthy) to record a triple-double in a Game 7. • 5/4/15 at Houston, recorded his third triple-double of the postseason in Game 1, becoming one of only seven players since 1985 to record three or more triple-doubles in a single postseason (M. Johnson, R. Rondo, J. Kidd, R. Westbrook, L. James & L. Bird). 2013-14 (Clippers): • Finished third in MVP voting. • Named All-NBA Second Team. • Appeared in 80 games (all starts) and averaged 24.1 points, 9.5 rebounds, 3.9 assists and 1.1 steals in 35.8 minutes. • Finished sixth in the NBA in scoring with 24.1 points per game and tied for 15th in the league in rebounds with 9.5 per game. • Ranked 16th in the NBA in field goal percentage (52.8%) and tied for 17th in minutes per game (35.8). • Averaged 24.1 points, 9.5 rebounds and 3.9 assists while shooting 52.8% from the field, becoming the first player since Shaquille O’Neal in 2002-03 to average at least 24 points, nine rebounds and three assists while shooting 50% or better. Since 1995-96 only five players besides Griffin had such prolific seasons (O’Neal four times, Karl Malone four times, Hakeem Olajuwon, David Robinson and Tim Duncan)... He was also the first player in more than 35 years to average at least 24.0 points, 9.5 rebounds and 3.5 assists in one of the first four years of his NBA career. Buffalo’s Bob McAdoo in 1975-76 was the last player to do so. Oscar Robertson did so four times, Kareem Abdul-Jabbar and Elgin Baylor did so in three seasons, while Billy Cunningham, Cliff Hagan, Connie Hawkins and Sidney Wicks did so once. • Scored 30 points with 12 rebounds against the Thunder on 4/9/14, marking the 12th time in 2013- 14 he tallied at least 30 points and 10 rebounds. In his previous three seasons combined, Griffin had just 17 games with 30+ points and 10+ rebounds. • Named a Western Conference All-Star starter for the third consecutive year and made his fourth All- Star appearance in as many seasons. He scored 38 points in the 2014 All-Star Game, a franchise record, and tied Kevin Durant and Rick Barry for the third most points in All-Star Game history. • Set a career-high with a streak of 30 games with at least 20 points or more. The streak came to an end on 3/27/14 when he had 18 points in a 109-103 win at Dallas. Griffin’s streak was the second longest in the NBA in 2013-14 and the longest by a Clippers player since the team moved to Los Angeles. • Became the eighth active player to top 6,000 career points before the conclusion of his fourth season and just the 63rd player in NBA history. He did so in just 284 games, becoming the first player since Kevin Durant in 2010-11 to reach 6,000 points in fewer than 285 career games, according to the Elias Sports Bureau. • Ranked seventh in the NBA with 43 double-doubles. • 4/3/14 recorded his fourth career triple-double in a 113-107 loss to the Dallas Mavericks. Griffin totaled 25 points, 11 assists and 10 rebounds. • Led team in scoring 48 times, rebounding 20 times and assists six times. • Was fourth in NBA in dunks with 176. Has 784 dunks in four NBA seasons. • Missed two games (1- back 3/31/14, 1 suspension 4/16/14). • With 14.9 seconds left in the second quarter 3/12/14 against the Golden State Warriors, he secured the 3,000th rebound of his career. 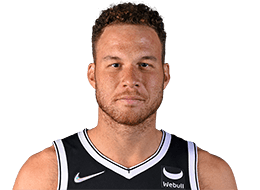 Griffin, 25, was just the third player in NBA history to top 6,000 points, 3,000 rebounds and 1,000 assists while also shooting 50.0% or better from the field before the end of his fourth season. Hall of Famers Kareem Abdul-Jabbar and Charles Barkley are the ONLY other players to do so. • Led the NBA in personal fouls drawn (581) and points in the paint (1,068). • 2/5/14 had 43 points, 15 rebounds and six assists in a 116-112 loss to the Miami Heat. It is only the fifth time since 1995-96 that a player exceeded those statistical minimums. Griffin has done so two of those five times, including 44 points, 15 boards and seven assists on 11/20/10 vs. New York. • PLAYOFFS: Averaged 23.5 points, 7.4 rebounds, 3.8 assists and 36.8 minutes in 13 postseason games (all starts). Scored 30 points or more three times, including a career playoff high 35 on 4/21/14 against the Golden State Warriors. • Averaged team-high 18.0 points and 8.3 rebounds in 32.5 minutes. • Became the fourth player since 2006-07 to average 18.0+ points, 8.3+ rebounds, 3.5+ assists and 1.0+ steals in a season, joining Kevin Garnett, Josh Smith and David Lee. Griffin was the only player in the league to do so in 2012-13. • Named a Western Conference All-Star starter for the second consecutive year, making his third All-Star appearance in as many seasons. • Led NBA in dunks with 202. • Was named Western Conference Player of the Week for the week of 12/3/12. The first such honor of his career. • Recorded his third career triple-double and first since his rookie season when he tallied 23 points, 11 rebounds and 11 assists against Milwaukee on 3/6/13. • Scored 10+ points 40 times, 20+ points 30 times and 30+ points three times, including a season-high 31 on 1/22/13 vs. Oklahoma City. • Led team in scoring 32 times, rebounding 37 times and assists seven times. • Put together a league-high streak of 11 games in a row with at least 16 points, seven rebounds and two assists. • Had his streak of 197 consecutive games end on 2/4/13 when he was forced to sit out with a strained left hamstring. • On 3/10/13 became the fourth player since 1985-86 to accumulate 22 or more points, eight or more rebounds and three or more assists while playing 22 minutes or fewer. • Finished third in the NBA in fouls drawn in the first quarter (131), shooting 71-104 (68.3%) from the foul line in the opening period. He was sixth in the NBA in total fouls drawn (436). • Averaged 23.2 points, 9.0 rebounds, 6.8 assists and 2.2 steals over a five-game span from 1/21- 1/27/13. It was the first time a player averaged such prolific all-around numbers in a five-game week since LeBron James did so 4/3-4/9/05. • Missed two games due to injury (hamstring- 2/4/13- 2/6/13). • PLAYOFFS: Second on the Clippers in scoring (13.2 ppg) in six playoff games (five starts). Averaged 5.5 rebounds, 2.5 assists and 26.3 minutes. • Started all 66 games, averaging a team-high 20.7 points on 54.9% shooting from the field, a team high 10.9 rebounds and 3.2 assists in 36.2 minutes. • For second straight season, started and appeared in every game. • Led Clippers in minutes, field goals, field goals attempted, free throws attempted, rebounds, points, personal fouls and turnovers. • Started first NBA All-Star Game, recording 22 points and eight rebounds in 31 minutes. Also appeared in Rookie Challenge and played 10 minutes. • Finished season ranked 10th in NBA in points per game, sixth in rebounds per game, seventh in field goal percentage and fourth with 41 double-doubles. • Led NBA with 192 dunks. • Only player in NBA with over 20.0 points, 10.5 rebounds and 3.0 assists per game. • One of two players in NBA (Dwight Howard) to average 20.0+ points, 10.5 rebounds and shoot 54% from field. • Led Clippers in scoring 31 times, rebounding 44 times, minutes 28 times, blocks 13 times and assists six times. • Scored 30+ points four times. Registered 20+ points 41 times. • Became one of five players under age of 25 to lead team in total points and rebounds. • Led NBA with 902 points in the paint. • Finished second in the NBA with 26 games with 20+ points/10+ rebounds. • His 103 double-doubles in his first two seasons is the fourth-highest in the NBA since 1986-87. • Became the first player since Shareef Abdur-Rahim (1996-98) to attempt over 1,100 free throws in his first two seasons. His 1,163 free throws attempted is the most by any NBA player in their first two seasons since 2000. • 12/30/11 vs. Chicago, recorded first double-double of season with 34 points (14-25 FG, 6-10 FT), 13 rebounds, three assists in 41:33. • 4/24/12 at Atlanta, scored Clippers season-high 36 points. • Grabbed national spotlight on 1/30/12 vs. Oklahoma City with a devastating dunk on Kendrick Perkins with 8:52 remaining in the third quarter. Finished game with 22 points (9-16 FG, 4-7 FT), seven rebounds, two assists and two blocks in 36:15. • PLAYOFFS: Started all 11 playoff games, averaging a team-high 19.1 points, 6.9 rebounds, 2.5 assists and 1.8 steals in 35.7 minutes. • Averaged 22.5 points, 12.1 rebounds and 3.8 assists in 38.0 minutes in 82 games (all starts). • Named the unanimous winner of the 2010-11 NBA T-Mobile Rookie of The Year award on 5/4/11…first unanimous Rookie of the Year selection since David Robinson in 1989-90. • The lone unanimous selection to the 2010-11 T-Mobile NBA All-Rookie First Team. • Named to Western Conference All-Star Team, becoming first rookie since Yao Ming in 2003 to play in game and first rookie since Tim Duncan in 1998 to be voted in by the coaches. • Won Sprite Slam Dunk contest during All-Star Weekend in iconic fashion. • Named T-Mobile Rookie of the Month all six times (November-April). • Shot 50.6% from the field. • Registered two triple-doubles, recorded a Los Angeles Clippers record 63 double-doubles and established a Clippers franchise record with 27 consecutive double-doubles from 11/20/10- 1/19/11. • 63 double-doubles was the most in franchise history since Bob McAdoo’s 69 in 1974-75. • Scored 40+ points two times, 30+ points 14 times and 20+ points 55 times, (the 7th highest total in NBA). • Set a Clippers rookie record for points in a game with 47 points on 1/17/11 vs. Indiana, the thirdhighest total in a game this season and the most by a Clipper since 1990. • Became one of just three players in NBA history aged 21 or younger to score at least 47 points with 14 rebounds, joining Michael Jordan and Rick Barry. • Finished as only player in NBA to average at least 20.0 ppg, 12.0 rpg and 3.0 assists and the third player since 2001-02 to do it. • Became first rookie since Elton Brand in 1999-00 to average at least 20 ppg and 10 rpg. • Set new Los Angeles Clippers record for most rebounds in a season (989), most rebounds in franchise history since Swen Nater had 1,017 in 1980-81. • Became one of only four rookies in NBA history to total over 1,600 points, 900 rebounds and 250 assists in their first season. • Established himself as Clippers franchise all-time rookie leader in points scored (1,845) and free throw attempts (695) and second in rebounds (989). • Finished the season ranked in the NBA fourth in rebounds per game, third in total rebounds, 12th in points per game, eighth in minutes per game, fifth in minutes played, eighth in field goals made, second in free throws attempted. • Finished the season tied for first in the NBA with 47 games of 20+ points and 10+ rebounds. • Was one of four players in NBA to average 20+ points and 12+ rebounds. • Established new Los Angeles Clippers record with 63 games of 10+ rebounds. • Became the first rookie since Jerry West on 2/26/61 to have a triple-double with at least 30 points, 15 rebounds and 10 assists when he had 33 points, 17 rebounds and 10 assists on 3/23/11. • Had a career-starting streak of 67 games scoring in double-digits, the longest by an NBA player since David Robinson did it in 77-straight games in 1989-90. • Became the third rookie since 1976-77 to record a 30 point, 15 rebound, eight assist game when he did it on 1/22/11 vs. Golden State. • Became the second rookie in NBA history and first since Oscar Robertson on 11/15/60 to have a 44 point, 15 rebound, seven assist game when he did it on 11/20/10 vs. New York. • Finished second in the NBA with 214 dunks. • Played in the 60th NBA All-Star Game, scoring eight points and grabbing five rebounds and passing for five assists in his first All-Star appearance. • Had 14 points and three rebounds in the T-Mobile Rookie Challenge. • Made NBA debut 10/27/10 vs. Portland, had 20 points (8-14 FG, 4-6 FT), 14 rebounds, four assists in 38:36. • 1/17/11 vs. Indiana, had 47 points (19-24 FG, 9-11 FT), 14 rebounds, three assists, one block in 36:56, became the first rookie since Allen Iverson to have two 40+ games in season. • 3/23/11 vs. Washington, recorded first career triple-double, had 33 points (14-19 FG, 5-8 FT), 17 rebounds, 10 assists. • 4/13/11 vs. Memphis, recorded second triple-double with 31 points, 10 rebounds, 10 assists in 40:30. • Had the 4th highest scoring debut of any Clippers rookie and the 3rd highest rebounding debut of any Clipper rookie. • Averaged 13.7 points, 8.1 rebounds and 28.0 minutes in seven preseason games played. • Did not appear in any Clippers regular season games. • Suffered a non-displaced stress fracture of his left patella during the Clippers’ last preseason game vs. New Orleans on 10/23/09. • Underwent successful surgery on his left knee 1/20/10 at the Kerlan-Jobe Orthopaedic Center in Los Angeles…The two-part procedure, specifically termed a left patellar fragment excision and a patellar tendon repair was a success and was performed by Dr. Neal ElAttrache who was assisted by Clippers Team Physician Dr. Steven Shimoyama. • Medically cleared to return to full contact practice in the month prior to 2010 NBA Summer League in Las Vegas, Nevada…Griffin practiced with the team but did not play in any games. • Averaged 18.8 points, 11.8 rebounds and 1.0 blocks over his two-year collegiate career. • Consensus National Player of the Year following his sophomore season. • 2008-09 postseason awards included the Naismith Trophy, Wooden Award, Oscar Robertson Trophy (USBWA) and Rupp Trophy as well as player of the year nods from the Associated Press, CBS/ Chevrolet, the NABC, Sports Illustrated, The Sporting News, Basketball Times, ESPN.com, CBSsports. com, FoxSports.com and Athlon Sports. • As a sophomore, earned Big 12 Player of the Year honors, Sportsperson of the Year honors, First-Team All-Big 12 and a record-tying six Big 12 Player of the Week awards. • As a freshman, voted First-Team All-Big 12 and Big 12 All-Rookie. • Finished his career with two-year NCAA Tournament averages of 22.3 points, 11.8 rebounds and 2.3 assists. • His 77.8 career NCAA Tournament field goal percentage (56-72) is a school record. • Averaged 22.7 points, 14.4 rebounds, 2.3 assists, 1.2 blocks, 1.1 steals and 33.3 minutes in 35 games played, while shooting 65.4 from the field during his sophomore season (2008-09). • Set Oklahoma and Big 12 single-season records for rebounds (504), rebounding average, field goal percentage and double-doubles. • Rebound total in 2008-09 was the highest in a season by an NCAA Division I player since Indiana State’s Larry Bird in 1978-79 (505) and rebounding average was the highest since Wake Forest’s Tim Duncan in 1996-97 (14.7). • First-Team All-Big 12 selection. • Named to the Big 12 All-Rookie Team. • Took part in the Clippers Teamwork at the Table Thanksgiving event at St. Joseph Center in Venice where he helped distribute food baskets and turkeys to over 300 families. • Continues to support Make A Wish to grant the wish of terminally ill kids in Los Angeles and nationwide. • Donated school supplies to schools in New York City during 2015 All-Star Weekend in New York. • Worked with the Salvation Army Seimon Family Youth and Community Center to distribute gifts to children during the holiday season. • Partnered with Feed the Children to help feed families in the Los Angeles. • Hosted local youth at home games during the 2010- 11 season as part of his PlayerZone. • Partnered with the Los Angeles Clippers, Kia and the California Endowment to open two playgrounds in Los Angeles and Long Beach during the 2012-13 season. • Participated, in conjunction with California Endowment, to open refurbished playground and basketball courts as part of the Clippers FIT Campus Program during the 2013-14 season. • Participated in Mastro’s Celebrity Server Dinner with the CP3 Foundation, benefiting LA’s Afterschool Programs and Leaps n Boundz, serving kids with learning delays. • Full name is Blake Austin Griffin. • Born in Oklahoma City, OK; Parents are Gail and Tommy Griffin. • Brother, Taylor, played one season with the Phoenix Suns in 2009-10.